At a time when significant social status, economic resources, and political opportunities seem to become ever more unequally distributed and only available to a few, this book represents the first systematic effort in recent years to develop a sociological model of elites and non-elites. In outlining a new typology of economic, political, and cultural elites, as well as drawing attention to the important role of non-elites, this accessibly written book provides novel insights into the structure of historical and contemporary societies. 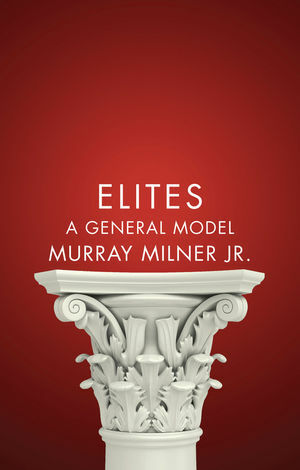 Milner identifies the sources and structures of economic, political, and cultural power, and investigates patterns of cooperation and conflict between and within elite groups. Analyzing politicians and propagandists, landowners and capitalists, national heroes and celebrities, ordinary folks and outcasts, the book applies its model to three distinctly different societies – ancient India, Classical Athens, and the contemporary United States – highlighting important structural commonalities across these otherwise very dissimilar societies. A significant contribution to scholarship, Elites will also be useful for an array of courses in sociology, political science, and history. Murray Milner is Professor Emeritus of Sociology, and Senior Fellow of the Institute for Advanced Studies in Culture at the University of Virginia. "Elites deserves wide attention. Writing with exceptional clarity, Milner balances the simplicity of deep conceptual structures with an empirical complexity spanning three sharply contrasting civilizations. He emphasizes, against purely economic and political approaches, that elite status can be powerfully based on distinctive cultural competences, which in contemporary societies involve increasing visibility. This is the first really new theory of elites in many decades." "Professor Milner provides a powerful set of social science tools for those keen to understand many of the pressing issues we face today. These include those concerned with the rise of the 1% and the decline of the rest; legalized corruption that deeply distorts our political process; and the influence of the military industrial complex." "In such historical circumstances, [… Elites: A General Model…] is not only timely and relevant, but also exciting. […] It is a refreshing contribution to the growing volume of elite-focused analyses of power and politics." "A first-class piece of scholarship and a lasting contribution to elite studies and political sociology more generally."